Finally the weather is getting colder even in Florida, so I decided it is time for a stew. 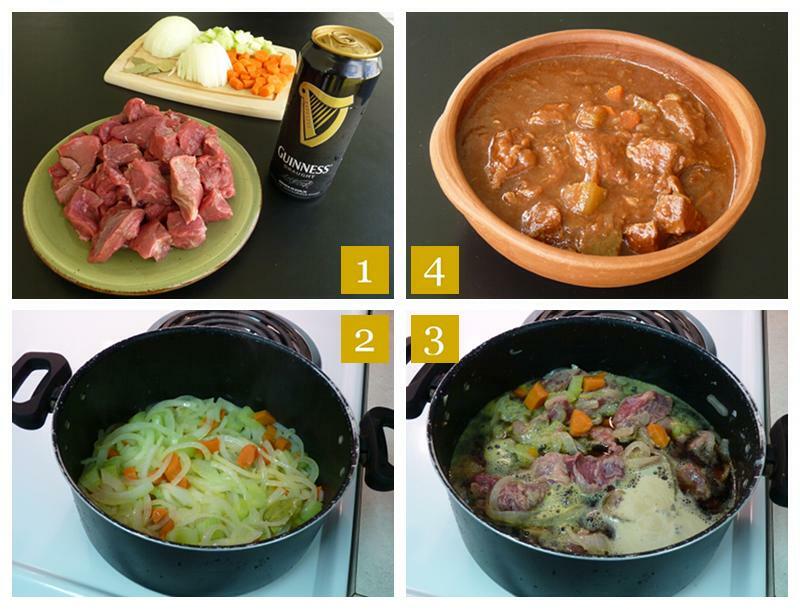 I was feeling in the mood for something new and instead of cooking one of my safe Italian stews, I decided I should try to cook something with Guinness. I found this recipe on the web (JamieOliver.com) and modified it according to my taste. It turned out very good! This is a reach stew, the meat almost dissolves and makes a creamy texture together with the quite high amount of veggies. I believe this is quite a healthy meal, definitely a complete one. 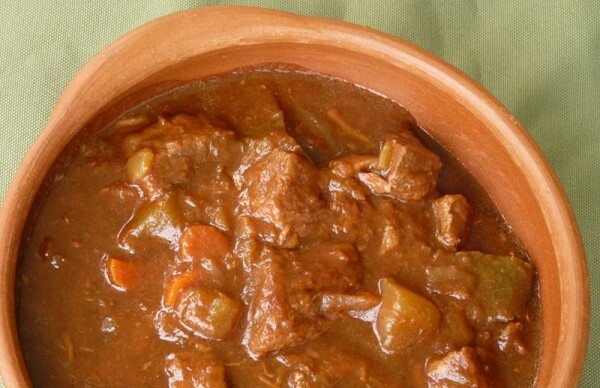 Bread is a must with this stew since you will need to do the “scarpetta”. “Fare la scarpetta”, to make a little shoe, in Italian means to wipe your plate with a piece of bread :) delicious! The following ingredients are for 4 portions. Start by preparing the vegetables. Peel and slice the onion. Peel and roughly chop the carrots. Remove the strings from the celery sticks and roughly chop them (picture 1). I used a regular pot but since this stew has a total cooking time of about 3 hours you may want to use a crock pot. Probably a casserole would work better than a regular pot. Pour the oil in the pot, toss in the vegetables and the bay leaves, mix and sauté over medium-low heat with the lid on for about 15 min. The onion should become soft but not turn brown (picture 2). Add the meat and the flour, stir to coat everything with the flour. Pour the Guinness and the strained tomatoes (picture 3). I use the Pomí strained tomatoes from Parmalat for all the recipes that require strained/chopped tomatoes. Add 1 teaspoon of kosher salt, grind some black pepper, and bring to a boil. Cook with the lid on, stirring occasionally for 2 hours and 30 minutes. Adjusting the heat to maintain a nice rolling boil. Remove the lid and cook for an additional 30 minutes or until it has thickened (picture 4). It looks very authentic :-) it is often served with potatoes of some form or placed in individual baking dishes and baked with puff pastry on top. @Mel: I did not dare to say it is Irish but from your comment I guess it is :) I definitely have to try it with the puff pastry! So you don’t add any water? All the stew is Guinness?! I’m making some right now and I’m excited to try it out! Hi Leah, correct, no water. The guinness and the strained tomatoes are all the liquid needed here.